April – July is a great time to stay at Mantarays Ningaloo Resort. Clear blue skies, immaculately clean water with unlimited visibility and plenty of whale sharks provides an unbelievable adventure. Make Mantarays Ningaloo your base for the World Heritage-listed Ningaloo Reef and Cape Range National Park. 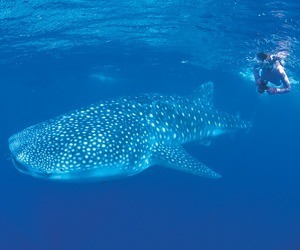 No matter what season, Ningaloo serves as nature's playground; famous for its whale sharks in autumn, giant turtles in summer and the annual migration of humpback whales to their breeding grounds in winter and return south in the spring. Mantarays Ningaloo guests will enjoy the best seats in the house watching the whales at play in the gulf out the front of the resort. Green, Loggerhead, Hawksbill and Flatback turtles drag themselves ashore to lay eggs and hatch their young. For underwater adventure, Ningaloo Reef is the largest fringing coral reef in Australia and the closest to the mainland, in some cases as close as 100 metres offshore, featuring more than 250 species of coral and 500 species of fish. On the land, nearby Cape Range National Park offers spectacular canyons and gorges as well as unique flora and fauna.